Ruminations by a non-academic general surgeon from the heart of the rust belt. I usually don't do laparoscopic cholecysyectomies in the middle of the night. Rare is the case you can't just hydrate, put on antibiotics overnight and operate the next day. But this guy needed emergent surgery; septic, confused, white count near 30,000. The gallbladder was basically dead; a flaccid, ashy-hued mishmash of once vibrant tissue. 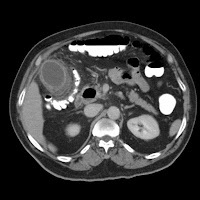 Furthermore, the edema from the inflammation was so intense, the right colon was being compressed (see CT) leading to significant cecal dilatation. Cases like this usually go suprisingly smoothly, even with the laparoscope, because the inflammatory reaction allows for easy dissection of anatomic planes. Two days later he was eating pizza and asking when the hell I was going to let him go home. He had Christmas presents to buy. One of the things I love about lap choles. Very few things exemplify 'cut to cure' as well. Merry Christmas to you and your patient! I am always concerned about this patient sneaking under the ER radar. We see two or three a year. Just as you said.... when called for "cholecystitis" at 1AM... I don't get excited.. but I have learned to ask a straight forward question; "How does the patient look". I am amazed that if I don't ask this... I might come in the next morning to find a septic patient. no radiological drainage and do it in the morning? I always take this very seriously in the 50 year old male. They are always the ones who go south in a hurry. I have never been sorry to come in in the middle of the night for one of these. Special interests in advanced laparoscopy, surgical oncology, and trauma care. 1. The cases and stories described on this blog are a fictional creation of the author. Many "facts" gleaned from the author's experience as a general surgeon have been altered for instructional and literary purposes. In no way are any of the stories told on this blog non-fictional accounts of actual patients. 2. By entering this blog, you agree to acknowledge that the author does not provide any medical advice and any medical information obtained from the blog is in no way a substitute for an evaluation by real health care professional. 3. Any opinions of the Author on the Site are or have been rendered based on specific facts, under certain conditions, and subject to certain assumptions, and may not and should not be used or relied upon for any other purpose, including, but not limited to, for use in or in connection with any legal proceeding. 4. The Site is protected by United States copyright laws. The Author hereby reserves any and all intellectual property rights in the Site. 5. Courtesy is expected when you decide to post comments. Be nice. Act like a jackass and I'll have to delete you.